On June 5th, 2016, twelve Mexican states held gubernatorial elections. AGUASCALIENTES – Martin Orozco Sandoval of the PAN was the winner, with 45.53% of the vote, edging out Lorena Martinez Rodriguez at 41.43%, who headed a four-party alliance of the PRI, PT, PVEM and the Nueva Alianza. Other candidates were Ivan Alejandro Sanchez Najera of the PRD with 5.15%, and Nora Ruvalcaba Gamez of the MORENA party with 3.15%. CHIHUAHUA – PAN candidate Javier Corral Jurado won with 39.51%. In second place was Enrique Serrano Escobar of the PRI/PT/PVEM/Nueva Alianza alliance with 31.18%. Jose Luis Varraza Gonzalez, an independent candidate, garnered 18.21% of the vote, while Cruz Perez Cuellar of Movimiento Ciudadano won 2.71%. DURANGO – The winning candidate for governor in Durango was Jose Rosas Aispuro Torres, of the PAN-PRD alliance, with 46%. In second place was Esteban Villegas Villarreal with 42.41%, who headed up a four-party alliance of the PRI, PVEM, Nueva Alianza and the Partido Duranguense. Alejandro Gonzalez Yanez of the PT had 4.23% of the vote, while the MORENA party’s Guillermo Favela Quinones had 2.77%. HIDALGO – At 45.60% of the vote was Omar Fayad Meneses of the PRI-PVEM-Nueva Alianza alliance. In second place was Francisco Xavier Berganza Escorza of the PAN with 28.90%, in third place was Jose Guadarrama Marquez of the PRD at 15.10%, and in fourth place was Salvador Torres Cisneros of MORENA at 7.70%. 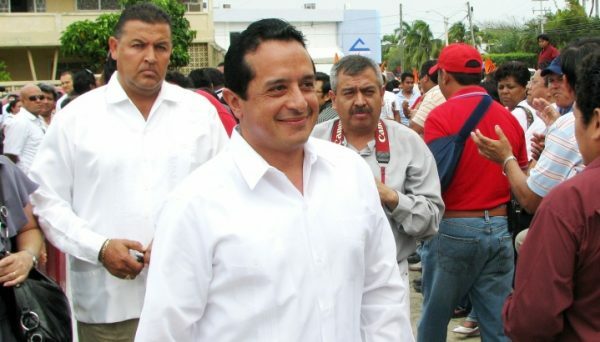 OAXACA – Ismael Murat Hinojosa of the PRI-PVEM-Nueva Alianza alliance won with 32.03% of the vote. Jose Antonio Estefan Garfias of the PAN-PRD alliance had 24.96% of the vote, while the MORENA candidate Salomon Jara Cruz had 22.81%, and Angel Benjamin Robles Montoya of the PT had 10.93% of the vote. PUEBLA – Jose Antonio Galia Fayad, standard-bearer of the PAN-Nueva Alianza-PSI-Compromiso por Puebla ticket won with 45.35% of the vote. In second place was Blanca Maria del Socorro Alcala Ruiz of the PRI-PVEM-Encuentro Social alliance with 33.59%, in third place was Abraham Quiroz Palacios of MORENA with 9.54%, and in fourth place was Roxana Luna Porquillo of the PRD with 3.84%. QUINTANA ROO – The winner was Carlos Joaquin Gonzalez of the PAN-PRD alliance with 45.68% of the vote, followed by Mauricio Gongora Escalante of the PRI-PVEM-Nueva Alianza alliance with 35.69%, then Jose Luis Pech Varguez of MORENA with 10.94%, and followed by Encuentro Social’s Rogelio Marquez Valdivia at 3.24%. SINALOA – The winner was Quirino Ordaz Coppel of the PRI-PVEM-Nueva Alianza alliance at 41.20% of the vote, followed by Hector Melesio Cuen Ojeda of the Movimiento Ciudadano-Partido Sinaloense alliance with 26.38% of the vote. In third place was the PAN’s Martin Alonso Heredia Lizarraga at 17.76%, and in fourth place was Jesús Estrada Ferreiro of MORENA with 3.78%. TAMAULIPAS – The winner was Francisco Garcia Cabeza de Vaca with 50.15% of the vote, followed by Baltazar Hinojosa Ochoa of the PRI-PVEM-PANAL Alliance at 36.03%. In third place was Gustavo Cardenas of the Movimiento Ciudadano with 5.81%, and in fourth place was Hector Garza Gonzalez of MORENA with 2.25%. TLAXCALA – The winner was Marco Antonio Mena Rodriguez of the PRI-PVEM-PS-Nueva Alianza Alliance, with 33.46% of the vote. In second place was Lorena Cuellar Cisneros with 29.91% of the vote, in third place was Adriana Davila Fernandez of the PAN with 18.36% of the vote, and in fourth place was Martha Palafox Gutierrez of MORENA with 6.2%. VERACRUZ – The winning candidate was Miguel Angel Yunes Linares of the PAN-PRD coalition at 34.41%, the second place candidate was Hector Yunes Landa of the five-party PRI-PVEM-PANAL-PC-AVE coalition at 30.53% of the vote. (These two candidates are cousins.) In third place was Cuitlahuac Garcia Jimenez of MORENA with 26.26% of the vote, and in fourth place was independent candidate Juan Bueno Torio with 1.90%. ZACATECAS – The winner was Alejandro Tello Cristerna of the PRI-PVEM-Nueva Alianza Alliance with 38.40% of the vote, in second place was David Monreal Avila of MORENA with 28% of the vote. In third place was Rafael Flores Mendoza of the PAN-PRD alliance with 18.50% of the vote, and in fourth place was Marco Antonio Flores Sanchez of Encuentro Social with 8.30% of the vote. INTERESTING DETAILS – Note that the Nueva Alianza Party (PANAL) always ran in coalition with the PRI with one exception, in the state of Puebla, where it ran with the PAN. Note too that only one gubernatorial candidate won with an absolute majority (Garcia Cabeza de Vaca in Tamaulipas, of the PAN). Three of the winning PAN candidates (in the states of Veracruz, Durango and Quintana Roo) had formerly been politicians of the PRI. There were also municipal elections in various states. In the Federal District (Mexico City) elections were held to choose 60 out of 100 citizens in a constituent assembly, tasked with the job of drafting a new Constitution for the entity. The voter turnout in the Federal District (27%) was rather low. AMLO’s MORENA party did the best in Mexico City, where it won the most votes. * MexiData.info note: Last March 16, Baja California Governor Francisco Vega de Lamadrid (PAN) told Uniradioinforma news that it is “almost certain” the next governor of the state will be elected to a two year only term. This due to the cost of elections. State legislation is under consideration to tie future elections to the federal triennial election cycle, with the vote for six-year term governorships according to the corresponding calendar. Mexico’s next federal elections are scheduled for 2018, whereas Baja California’s gubernatorial election is slated for 2019. And the subsequent midterm federal elections will be two years later, in 2021.